There is a widespread cynicism about this year's presidential election. For many people, the choices seem dismal. If you felt downcast before watching the first presidential debate, you'd probably only feel more that way after watching it. Mr. Trump was certain to mention his concern for workers in Ohio and Michigan and his love for the state of North Carolina. What a great coincidence that those are all swing states within his reach. Similarly, Mrs. Clinton made sure she mentioned being a grandmother in her first two sentences and painfully attempted to convince people of her middle class roots by describing her father's work as a drape maker. While there are most definitely stalwart supporters of both of these candidates, many people feel discouraged and dismayed that these are our choices. When we vote, we make a moral decision. For Catholics, this can be a struggle. No Catholic with a well-formed conscience could pretend that Mrs. Clinton's support of abortion and her advocacy for Planned Parenthood are just "one issue among many issues." To do so would be basically to conclude that the Fifth Commandment (Thou Shalt not kill) is not really such an important commandment. This reality angers a lot of Catholic Democrats because it seems like the Church is saying you can never vote for a Democrat (since almost all nationally run Democrats are pro-abortion). Of course, if Catholic Democrats took their obligation seriously, they would stand up to their party and put up Pro-life Democrats. On the other hand, Catholics who take seriously the Gospel of Life, and who could never support Mrs. Clinton's pro-abortion platform, are hard pressed to feel giddy about voting for Mr. Trump. His demeanor, rhetoric, and his cavalier attitude regarding the rounding up and deportation of persons who have entered the US illegally hardly reflects the Gospel message of welcoming the stranger and loving the poor. If Catholic Republicans took their obligations seriously, they would stand up to their party and not allow candidates to run on a platform of anger and vitriol. Today, a friend of mine is undergoing surgery. She is donating part of her liver so that someone else can live. The other day some students from the Boston University Catholic Center went out and fed the homeless. It is true that Catholics need to do a better job influencing the political system, but our vote every four years is not the only--or primary--way in which we change the world. Sometimes during election season--due to the 24 hour coverage--we are led to believe that everything hinges on our vote and our vote is the most important thing in the world. We are led to believe that one of these two people hold the key to the meaning of life. Because they are the last two standing, we are led to believe that one of them must be good and the other evil. Yes, our vote is important, but we regular Catholics exercise so much more power than just our every four year vote. A woman is donating part of her liver today. That is so much greater than a vote. 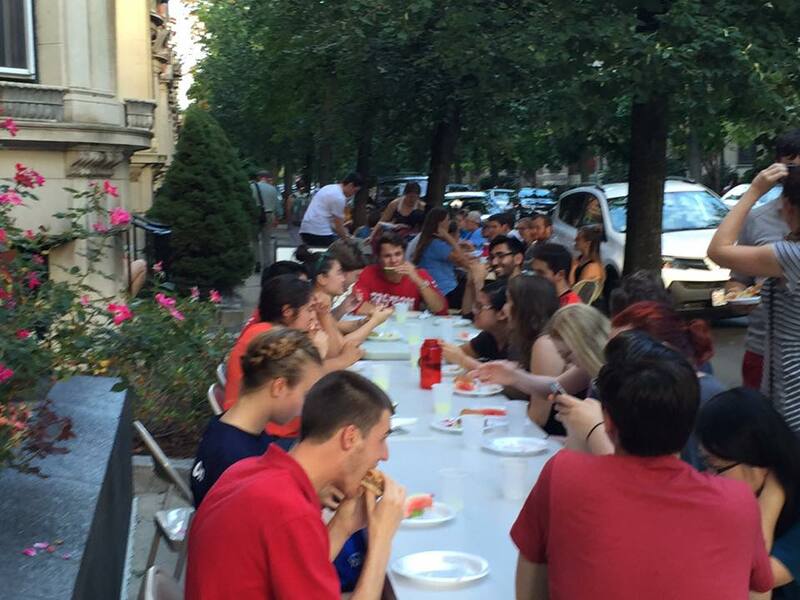 People didn't go hungry last Sunday night because Catholic students fed them. That is so much greater than a vote. Catholic parents are raising their children to love God, to worship God, and to become saints. That is so much greater than a vote. Today a Catholic will help someone go to Confession and receive forgiveness of their sins. That is so much greater than a vote. Today a Catholic will reach out to someone who is lonely. That is so much greater than a vote. I'm not dismissing the importance of voting (and of voting according to the Gospel). But, I also want to dispel the lie that that is the most important thing we ever do. We must be called to something far greater than casting a vote for the lesser of two evils. Somehow election season seems to reduce us to this mentality. We think that we are defined by Trump and Hillary. But, we are so much greater than that. As Catholics, we are called to something greater. We are not cogs in the electoral system. We are meant to be the true protagonists of history. This morning, while I was praying, I was re-reading a book on the Beatitudes and this quote struck me: "At a time when Christians are committed with renewed concern to the destiny of men and society, they need to give special attention to the Sermon on the Mount if they would avoid drifting along like straws in the current of history, a history which they should be redirecting, so as to shape it to God's plan" (The Pursuit of Happiness--God's Way: Living the Beatitudes. Servais Pinckaers). I found that quote so helpful. So many Catholics feel right now like straw floating in the current of history, our options narrowed down to two. But this is not so. We should be redirecting history according to God's plan. Who we vote for is important and we will be held accountable for our vote. But, voters are not all we are. We are not just mere voters. We are the protagonists of history. 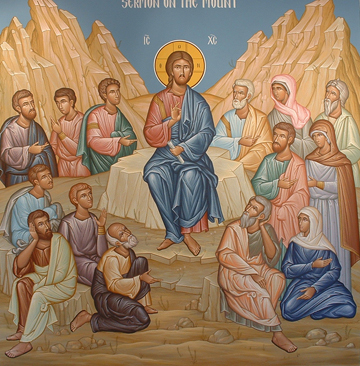 When we become holy, when we grow in virtue, when we repent of our sins, when we live the beatitudes and practice the spiritual and corporal works of mercy, when we worship God, live by Faith, act in Charity, when we do all of these things we are no longer straw. We become instruments of the Holy Spirit, instruments used by God to change the world. The lie is that we are merely voters. The lie is that our life is defined by the choosing of one of two candidates. But such an outlook reduces who we really are. As Christians, we are called to live the Sermon on the Mount. This sermon, however, is not merely a moral command. God sends the Holy Spirit into our hearts and works these things in us. I offer a simple proposal today. We should all read Chapters 5 thru 7 of St. Matthew's Gospel. Don't read it and think about Trump and Hillary. Read it and think, "This is Jesus speaking to me." The way the world is changed is by allowing Jesus to change us. Don't be just a voter. That would be demeaning and boring. Be a disciple. Be a protagonist. When I reached over to shut my alarm off a little before Five this morning, I had a text waiting for me. It was this photo. It was a nice way to begin a new day. The three men pictured there are all alumni of the Boston University Catholic Center and, along with four other alumni, are now seminarians. These three, however, have another bond. After graduating from BU, they each spent a year (or two) working as the intern at the Catholic Center. The word "intern" doesn't really convey accurately what they do. The interns fundraise their own meager salary and dedicate themselves to serving the community here. They organize programming and keep on top of a thousand details. In addition, they reach out to students, evangelize, and provide a great example. I not only appreciate the work that the interns have done, but I also am grateful for their friendship and for the many Holy Hours spent praying with them. One reason that I love this photo is because I know that when I post it, it will bring a lot of joy to the whole Catholic Center community. The students and alumni will love this photo because they love these guys, and the community here takes joy and pride in the vocations that have come from the Catholic Center. It also brings me joy because I know the feelings are mutual. Whenever I talk to these guys, they have a million questions about the Catholic Center. 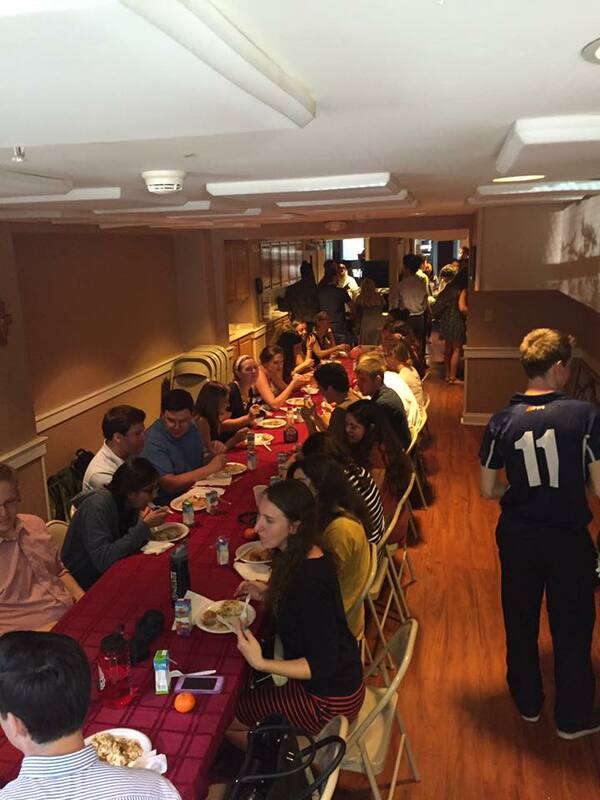 They love the Catholic Center, love what happens here, and feel profoundly connected to the lives of the current students. They always ask, "Who is coming to seminary next?" When I look at this photo, I see not only these three guys, but I see the other four alumni who are in seminary, and I see the love, prayerfulness, and joy of the entire BU Catholic Center community. At every Mass that we celebrate at the BU Catholic Center, we pray for vocations to the priesthood and the religious life. Specifically, we pray, "For an increase of vocations to the priesthood and the religious life, especially from this community." In the parish, I always prayed, "For an increase of vocations to the priesthood and the religious life, especially from this parish and from your families." Vocations don't drop from the sky. They come from real families and real communities. I am convinced that when we ask the Lord to give vocations from our specific community, he does. On a regular basis, I offer Mass for that intention. Oftentimes, once a parish or a community gets one or two priestly or religious vocations, more follow. When I look at the photo above, my mind sees the good work of so many people--students, staff, chaplains, alumni--over the course of many years. Over the years, the BU Catholic Center has been a place where the sacraments are loved. Confessions are an important part of life here. The Blessed Sacrament is adored. Mass is at the heart of life. People learn how to love each other and enter into profound friendships. There is joy. There is a real community. Students care about one another's spiritual lives and want to help others to experience the joy of the Christian life. They love one another. When a Catholic community possesses these types of characteristics--fraternal love, piety and devotion to the sacraments, evangelical zeal, and prayerfulness--it's almost as though you can't help but have vocations flourish. Where people know that the Sacraments matter, priestly vocations will flourish. The photo above is about a great Catholic community. It is something which ought to bring joy to those who are at the Catholic Center today and those who laid the foundations over the years. It ought to bring joy to alumni, benefactors, and current and former staff. It ought to bring joy to those who invest in Campus Ministry. It ought to bring joy to the army of friends who faithfully pray for vocations. The Lord is doing something beautiful among us. This is what the friendship of the Church looks like and I'm grateful to be a part of it. It's dramatic, but it is also simple. There is big "D" Drama, but no little "d" drama. Jesus called and Matthew follows. He leaves everything and follows. That's big "D" Drama. But there is no wasting time with little "d" drama. "What about my money? What about my work? How about I draw up a list of pro's and cons and then think about them for a few years?" So often, the word "discernment" comes to mean, "How can I talk myself out of God's call?" Sometimes when we have heard Jesus speak to us, we go into a never ending process of discernment. This can be especially true for those whom Christ has called to follow him in the vocation to the priesthood. Instead of just getting up and following Christ, I've seen men go into a perpetual state of "discernment." It is a state of never trusting what is in front of them, but instead living with an unhealthy sense that perhaps this encounter with Christ is false and should be distrusted. Maybe it is all a big misunderstanding. But, this is true in other ways too. We hear Christ telling us to forgive our enemy and we look for loopholes. We hear the Lord inviting us to confession and we search for excuses. We hear the Lord calling us to forgo some particular sin and we invent reasons why Jesus couldn't possibly mean that. His word penetrates our heart and our shields go up and we find ourselves saying, "Well, Jesus couldn't possibly have meant that" or "Jesus lived a long time ago and things were different then." Another tactic we use when Jesus stands in front of us and calls us--be it to a vocation or to some particular action--is to endlessly search for advisors. Perhaps if we poll enough people, someone will let us off the hook. This curse of endless discernment can be a terrible hindrance to growth in the Christian life, basically leaving us in a constant state of spiritual paralysis. So much of life happens in an instant. The inspiration to say a prayer comes our way, we either seize that opportunity or it passes us by. The beggar on the street holds out his hand. We either respond with some act of kindness or we don't. That moment passes us by. What always strikes me about the call of St. Matthew is that we are told that Jesus was passing by. Would Jesus have come back again? We simply do not know. We know that he was passing by. He was on the move. This was Matthew's chance. It all happened in an instant. Matthew would have an entire lifetime to continue following the Lord, but this particular call would only happen once. Today the Lord is passing by. If he stops and calls us, do not waste time. Do what Matthew did. He got up and followed. 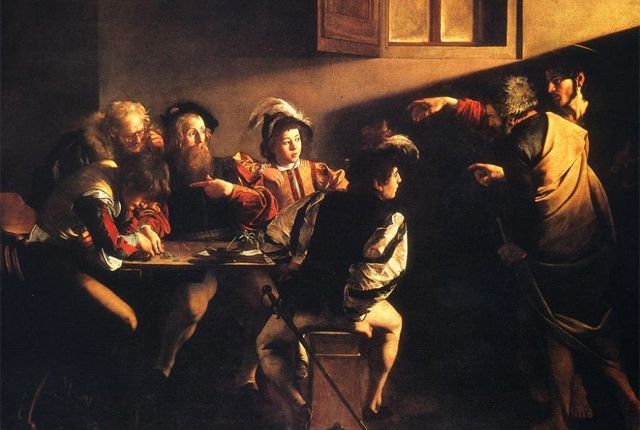 The call of St. Matthew consisted of two words: "Follow me." It's a bit maddening, isn't it? This is how Jesus' word comes to us. It is concise, clear, and penetrating. In a way, we really do look kind of silly when, in our efforts to escape from his gaze, we turn these two simple words, "Follow me," into a complicated process of endless handwringing. Is Jesus calling you to be his disciple? Follow Him. Is Jesus calling you to forgive your enemy? Follow Him. Is Jesus calling you to the priesthood or religious life? Follow Him. Is Jesus calling you to give up some particular sin or unhealthy relationship? Follow Him. Is Jesus calling you to go to confession? Follow Him. Is Jesus calling you to pray? Follow Him. 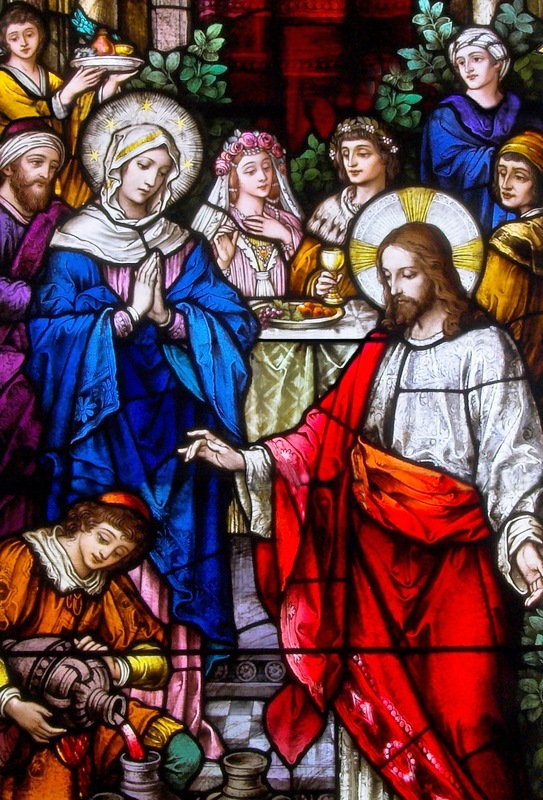 Is Jesus calling you to go back to Sunday Mass? Follow Him. Is Jesus calling you to give something up? Follow Him. In the end, we can spend months and years in a complicated process of trying to interpret ourselves out of doing whatever it is the Lord is asking of us. But, in the end, no matter how much time we take, the invitation is still the same: "Follow me." Today, Christ is passing by. Follow Him. The other morning I received an email containing a witness talk that one of our students will give on an upcoming retreat. As is often the case when I read such talks, I was really moved by its sincerity, by its depth, and by the grace that made him able to write his testimony. What was so beautiful about his witness talk was how he continuously identified how God had been working in his life--oftentimes in and through others. He conveyed this incredible sense of God pursuing him, inviting him, and drawing him closer and closer. Sometimes in our efforts to become holy or to have strong parishes and Catholic communities, we mistakenly think that we are the ones who will do it. We think that my efforts will bring about my holiness. Or, we think that our planning and strategizing will transform a dead parish into one filled with life. As one Psalm reminds us, however, "If the Lord does not build the house, in vain do the builders labor." It is, of course, a subtle balance. We have to cooperate with God's grace. We have to use well the gifts that he has given to us. We ought to be intelligent about our pastoral priorities. At the same time, however, we must always live like the Hebrew people, wandering in the desert, totally dependent upon the Lord to feed, protect, and guide us. Planning, programs, and strategies are all great as long as they are not a Tower of Babel built as a monument to human pride, but rather arise from a people humbly dependent upon the Lord. The Book of the Prophet Ezekiel can assist us in our desire to build strong parishes. The Hebrew people had been exiled to Babylon because of their idolatry and wickedness. They had defiled their own land and were thus scattered and dispersed. How did they come back? Was it through their own holiness? Their own ingenuity? Their own strategies? No. The Lord says, "I am about to act." It was by God's grace that they were returned. And how does this return begin? The Lord says, "I will sprinkle clean water upon you, and you shall be clean from all your uncleannesses, and from all your idols I will cleanse you. A new heart I will give you, and a new spirit I will pour within you . . . "(EZ 36:24-26). The people returned. They returned to the land which the Lord had given to their fathers. Where there had been famine, the Lord now promised abundance. Before, the people were ashamed because they endured famine while the nations around them flourished. Why did this happen? Because of their iniquities, because of their idolatries, because of their sinfulness. They were the cause of their downfall. They were the cause of their shame. Places that had once flourished were now desolate and were mocked by all who passed by. Does this not, in some way, teach us something about our parishes? I am not suggesting an exact equivalence, but is there not some lesson for us to learn from the Prophet Ezekiel? Is it possible that our parishes which were once thriving are not only empty because of scandals, secularism, and shifting demographics, but perhaps also because we are in need of a new spirit within us? Have we perhaps turned toward idols? Have we desecrated the land by our lack of holiness? Have we forgotten the Lord? If so, then the rebuilding of parishes requires firstly a rebuilding of souls. Each of us needs to be rebuilt by the Lord. It is principally through the sacraments that God rebuilds us--sprinkles clean water upon us, cleanses us, and gives us a new spirit. While it is tempting to want to build great parishes, great parishes are the result of great conversions. Great conversions are the result of great graces. Great graces come from the Lord. One of the things that is exciting about campus ministry is that young people are always willing to charge ahead and try something new. They are enthusiastic about sharing the faith and they are talented and creative in their methods. One thing, however, has become clear to us over time. No matter how good our slogans, how catchy our retreat names, how much we make ourselves present on social media etc, nothing--absolutely nothing--is more effective than a personal invitation. When one student who has been given a new heart by the Lord reaches out in love and friendship to another student, that is our most effective tool for evangelization. What works is when one student witnesses to the love of Christ and extends the hand of Christian friendship to another. What works is not when we try to do something purely from our resources, ingenuity, skills, and force of will. What does work is when we are so moved by our encounter with the Lord that we place all of those things completely at his service in love for others. In parish planning, I suppose the thing that we can most do is to try and provide the best environment for allowing people to encounter the Lord and to be rebuilt by him: places where they can hear the Word, places where they can go to confession and receive spiritual direction, places where they can live the friendship of the Church, places where they can worship God, and spend time in prayer before the Eucharist. What we can do is to have a place where we have been rebuilt by the Lord and are moved to invite others to share in the joy of that experience. 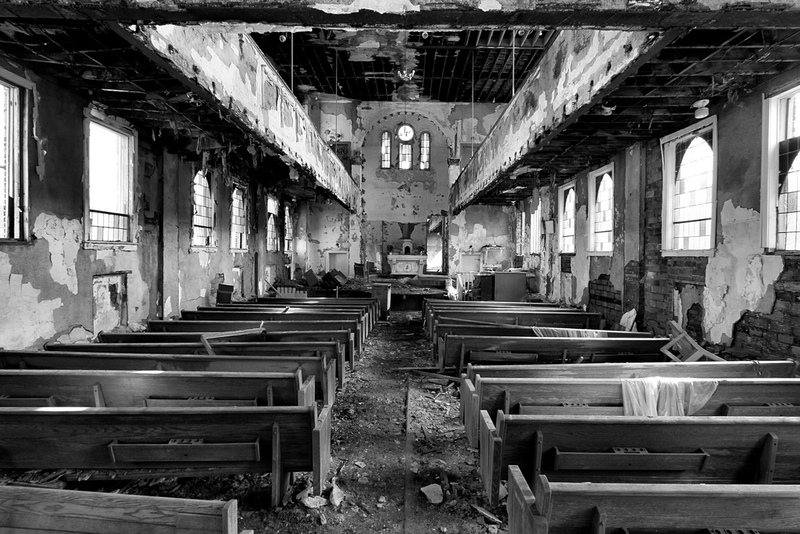 If we want such places, if we want parishes that are flourishing and strong, we have to begin by humbly allowing the Lord to rebuild us. We have to be cleansed from our iniquities and idolatries. When St. John Vianney arrived at his parish in Ars, the parish was stagnant and desolate. John Vianney knew that his parish would be rebuilt by the rebuilding of souls and that souls are rebuilt in the confessional, at the altar, and from the pulpit. The salvation (or the rebuilding) of the whole world began not with the conversion of Rome. It did not begin in places of prestige or power. It began in the most desolate of all places. It began in the womb of the Blessed Virgin Mary. God acted. Mary cooperated. It was there--in the smallest of all possible ways--that God began to rebuild the world. None of us would ever have ever devised such a strategy! It began by Mary hearing the Word and welcoming the Word. To build strong parishes, we need to be humble enough to allow God to rebuild us. "Thus says the Lord God: On the day that I cleanse you from all your iniquities, I will cause the cities to be inhabited, and the waste places shall be rebuilt. And the land that was desolate shall be tilled, instead of being the desolation that it was in the sight of all who passed by. And they will say, 'This land that was desolate has become like the garden of Eden; and the waste and desolate and ruined cities are now inhabited and fortified.' Then the nations that are left round about you shall know that I, the Lord, have rebuilt the ruined places, and replanted that which was desolate; I, the Lord, have spoken, and I will do it" (Ezekiel 36: 33-36). Nothing will rebuild churches better than allowing the Lord to rebuild us. Our goal, however, shouldn't be on rebuilding parishes. Our goal, I think, should be on cooperating in the Lord's work of rebuilding souls. That seems to be the way he works. He rebuilds souls and then the ruined cities become inhabited. He is the Lord. He has spoken. And he will do it. This is very good news. 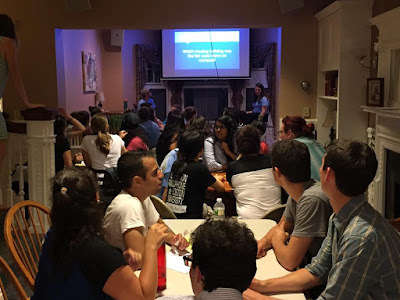 First Week at the Boston University Catholic Center is packed with various events intended to welcome new students to our community. Even after completing my fourth "First Week," I am still greatly impressed by how the Catholic Center community has a knack for evangelizing and organizing. The students who come here are busy. They belong to clubs, frats, sports teams. They are taking demanding courses and working jobs. In the midst of all of this, they still manage to have a solid life of prayer and devotion to the sacraments, intentionally reach out to others in evangelization efforts, and form friendships with depth. It's really impressive. They are the ones who organize all of the events. There is one event from this First Week that stands out for me. Firstly, let me provide some background. Sometimes, if I feel like the congregation at Mass is getting a bit sluggish in its responses, I may mention during the homily or at the end of Mass, something to this effect: "Sometimes, when I am offering Mass, I wonder if someone came up the steps of the church and looked in what would their reaction be? If they see a bunch of people standing there with blank stares, not singing, looking bored and disengaged, they might conclude, 'All of these people are being held hostage. I better get out of here before I am captured too.' On the other hand, if they see people totally engaged, singing, prayerful, and joyful, perhaps they will think, 'I want to stay here.'" This past Sunday, the congregation was doing okay with its spoken responses and there was a good feel about things. The church (perhaps because it is still the beginning of the year) was filled more than usual. But, during the homily I gave my little speech about singing etc, trying to be humorous about it, but trying to make the point too. What I didn't know at the time was that what I had said was actually happening at that very moment. Grad School at BU. The Missionary happened to be sitting next to him at Mass. When it came time for the Sign of Peace, she turned to him and he said, "I don't know what I should do now. I'm new here." She welcomed him, helped him, and after Mass invited him to our breakfast. When I met him he said, "I looked into the church, saw all of those people, and heard the beautiful music and I thought, 'I want to belong to this people.'" This totally made my day. There are so many levels why this makes me happy. The people who sing at Mass in the choir, who show up for a rehearsal when they're tired, who give of themselves etc, it's not about them. It's about this young man who heard something beautiful and was moved by it. When people show up for Sunday Mass, it isn't just about them. It's about someone looking in the back of a church and seeing a huge crowd of young people and thinking, "This looks interesting." Who knows? Maybe if a good portion of those young people had decided to skip Mass this Sunday or to look bored and disengaged, that young man may have looked in and said, "I don't want to belong to this group." When we go to Mass, we go not only for ourselves, but for others. When we sing at Mass, we sing not only for ourselves, but for God and for others. The people who made breakfast, set up tables, cleaned up afterwards . . . they were all helping someone to feel drawn into a communion of life. That FOCUS Missionary was a friendly face. She welcomed a new person. She didn't know that a new person was going to sit next to her. But, when he did, she made him feel welcome. The other FOCUS Missionary who gave him a tour of our building, made this new person feel welcomed. When they gave this man a tour of our chapel, he asked them to teach him how to genuflect and how to make the Sign of the Cross. This is so awesome. He's not baptized and knows nothing about Catholicism, but was moved by what he witnessed in others. Before we can invite others to be part of something, we first actually have to possess something. We cannot focus on inviting others if we are not already part of something that moves us, inspires us, and gives us new life. Techniques can be helpful, but they cannot replace authenticity. 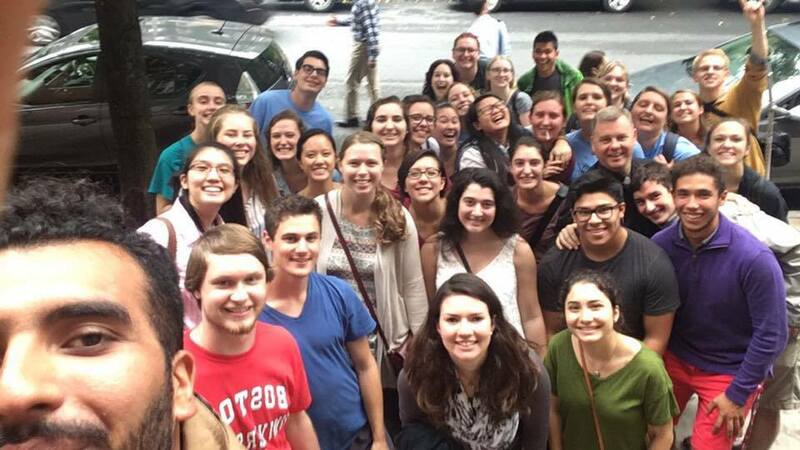 At the very foundation of evangelization is a fidelity to an encounter that moves me. Without this, we can sound like we are selling a product that we really don't believe in. But, when we believe it and are moved by our life together in Christ, we are moved to share that joy with others. It is then that techniques can be helpful. But no technique can replace true communion. Another thing I've learned at the Catholic Center during the past three years is that nothing is better than a personal invitation. We can use social media, bulletins, and apps, and all of these can be beneficial, but the most effective method is that of personal invitation. We can use the media to assist us in our mission, but nothing can replace person to person invitations. We often will ask people, "How did you find the Catholic Center?" or "Why did you come on this retreat?" More often than not, the answer is, "So and so invited me." I hope some day someone will ask a man, "Why did you become Catholic?" and he will answer, "I heard this beautiful music from inside a church. I looked in, saw all of these young people praying and singing. Then someone invited me to a breakfast and everyone was so joyful to meet me. That's why I became a Catholic." Several years ago I was visiting a parishioner of mine and somehow the conversation turned towards World War Two. In a flash, her face filled with emotion and her voice shook with a mixture of sorrow and anger as she remembered the bombing of Pearl Harbor. I remember thinking how amazing it was that (at the time) almost sixty years had passed since that horrific event, but that she welled up with emotion as though it happened just days before. I think of that conversation as we now approach the fifteenth anniversary of the September 11th attacks. Most of the students with whom I now serve only have vague memories of that day or no memory of it at all. For most of them, it is a defining date in history, but they don't remember that beautiful September morning. They don't remember what it was like to live in a world where they didn't have to worry about an unattended backpack. For those of us who do remember that day, it is not like a page from a history book. For us, it is less like going through the archives of a library and more like going through a family photo album. We were all suddenly close to one another. Those firemen and police personnel were members of our families. The stockbrokers, secretaries, passengers, they were our neighbors. Even though for many of us, we had never met these people, we mourned them. We still do. Every year, as this date approaches, like many others, my mind begins to turn the pages of that photo album. I was a young priest, ordained just four years. I was teaching catechism in the Seventh Grade classroom when the teacher from next door came in and told me a plane had hit the World Trade Center. In my mind, I thought she meant some small plane. Certainly a tragedy, but I was confused why she had interrupted my class to tell me that. I thanked her and went back to teaching. A short while later she came back and said that a second plane had hit and that they think it might be a terrorist attack. Parents were calling the school to see if we were going to dismiss the students. I was even more confused because I was thinking, "Okay, two small private planes hit the building. How much damage could that do? And why would we dismiss school?" She told me that since the principal was out of the building and parents were calling, perhaps I should go to the office. I went downstairs and passed the music room where some teachers were watching the television. I was dumbfounded. Another memory I have is that I asked the pastor if we could offer an evening Mass that night just in case anyone wanted to come. These were the days before social media, so any advertising for the Mass was purely word of mouth. That evening, our church was packed. A few days later, we had Mass in the middle of the day for a day of mourning, and again, the church was jammed packed. It touched me that in that moment, so many people turned to God. I remember ending my homily by quoting the last verse of "America:" "O Beautiful, for patriots' dream that sees beyond the years. Thine alabaster cities gleam, undimmed by human tears. America, America, God shed his grace on thee. And crown Thy good with brotherhood from sea to shining sea." We remember hearing the stories of those whose lives were taken, the heroism of so many brave men and women, and the endless sound of bagpipes. We remember seeing images of parking lots filled with cars whose owners would never return to reclaim them. I remember seeing news footage of the next day at Buckingham Palace when they played the Star Spangled Banner at the Changing of the Guard. It didn't last long, but for a brief moment, amid a national tragedy, we were all together. We stood together. We mourned as a family and we reacted as a family. There still remained political differences among us, but what united us was stronger than what divided us. When I stand for the National Anthem, I don't do so because I think America is perfect. It never has been perfect. I stand because, despite our imperfections, our disagreements, and even our failures, we are a people. We are a family. I will stand because of soldiers who died on the beaches of Normandy and for men who built railroads across the land. I stand for those who marched with Martin Luther King, Jr and with those who advocate for the protection of the unborn. I will stand for parents who raised families and sacrificed for their children. I will stand for firefighters who laid down their lives for others. I will stand for Whites, Blacks, Latinos, Asians, and Native Americans. I will stand for Protestants, Catholics, Jews, Muslims, Hindus, Buddhists, and Atheists. I will stand for teachers, union laborers, attorneys, nurses, doctors, and the unemployed. I will stand for young and old, healthy and sick. I will stand for the homeless and the wealthy. I will stand for Democrats, Republicans, Libertarians, and Independents. I will stand even for those who misguidedly refuse to stand with the rest of us. 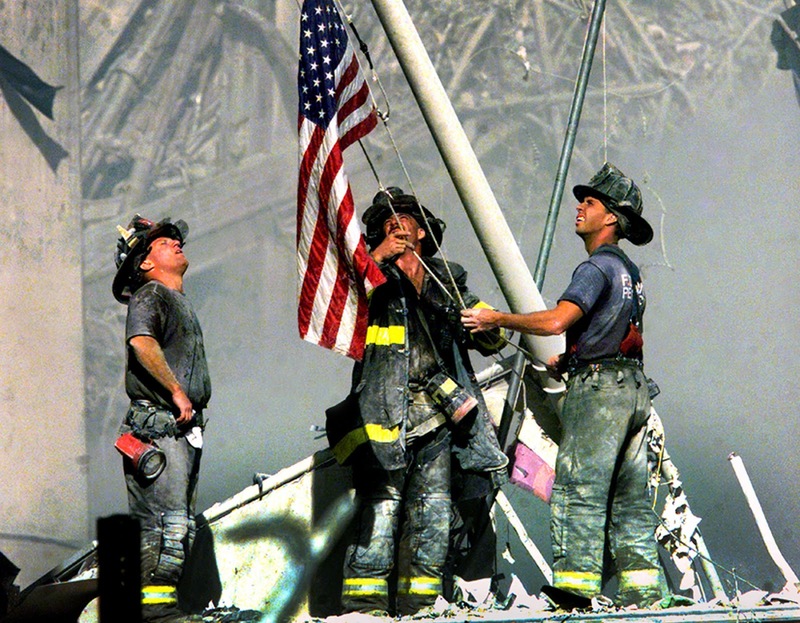 On September 11th 2001, we stood together as a nation. That's where I still stand, together. Overheard at the Barbershop: Is the Catholic Church Getting Rich Off of Your Wedding? Early on in my priesthood, I recognized that there is an inverse proportion between the amount one gives to the Church (in terms of time and treasure) and the amount that one expects from the Church. The people who are the most generous in terms of their time and monetary gifts are often the people who expect the least in terms of special treatment. On the other hand, folks who rarely attend church or who give little in terms of time and treasure, often expect the most. So often, their expectations are based on the fact that, "My grandmother sang in the choir here all her life." But people who are truly involved in the life of their parish have a sensitivity to understanding that somebody has to pay to keep the lights on, the sidewalks shoveled, the roof from leaking, and the pipes from freezing. The more involved someone is in their parish, the more they feel responsible for it. As a chaplain at university, most of my weddings take place in the university's inter-denominational chapel. The other day, a couple emailed me to ask when they should pay my $500 fee. (On the chapel website, in addition to the other fees, it mentions that the fee for the minister for a wedding is $500). Fees such as this are not uncommon in many churches. Like every person who works, a minister needs to earn a wage. Similarly, the person who plays music for a church needs to earn a wage. This is why churches "charge" money. The building, the personnel, the infrastructure that exists in order for someone to have their wedding at this church all costs money. It is reasonable to expect that people who are paying a limo driver, a wedding coordinator, airline tickets, a florist, a band, a reception venue etc, also contribute something towards the expense of running a church. Although most churches charge a fee for the person officiating at the ceremony, the Catholic Church does not. Priests do not charge for the sacraments. In fact, priests are prohibited from charging for the sacraments. When a fee is charged at a Catholic Church, none of that money actually goes to the priest. I think some people have the misperception that it does. That money goes to the church itself. (And, if a couple were unable to afford that fee, it would be easily waved). So, the couple who recently emailed me about the $500 fee must have been pleasantly surprised when they learned that there is no such fee! Instead, I told them that they are free to make some donation to the Catholic Center. Many couples choose to give the priest a gift when he has officiated at their wedding. What does the priest do with that money? Firstly, I should say that the priest is not getting rich from an occasional hundred dollars from a grateful wedding couple or from some other parishioner! I think that most priests use those gifts to pay it forward. We use them to support seminarians, to donate to particular charitable causes that we might not be able to support otherwise, or to help people that we know who are in need. I know of one priest who would use any gifts that he received to help pay tuition for some children from a family who had fallen on difficult times. I have celebrated many weddings in my priesthood, but one of the most beautiful was a young couple who had very little money. They came to Mass every Sunday together, tithed from the little money that they had, and were just amazing parishioners. When it came time for them to get married, they wanted a full Mass, but they wanted it to be simple. They invited only a handful of guests and there were no frills, expensive dresses, or limos. Their reception was at a local restaurant and maybe had twenty people at it. Since they were so active in the parish and they had very little to begin with, I told them not to pay the fee for the church, but a few days after the wedding, they dropped off the church fee. They said that they had been given some generous wedding gifts and felt that now that they could afford the fee, they wanted to pay it. Their simplicity and their generosity still moves me many years later. Why do I mention all of this? It is easy sometimes for Catholics to feel obliged to indulge in self-hatred and to go along with the myth that a parish that charges $500 or $800 is really ripping people off, and the priests are getting wealthy from it. It's an easy and entertaining myth to promote. Instead, isn't it reasonable to ask whether those who benefit from a particular church should feel any obligation to help pay for the custodian, the heat, the music, the electricity etc? But, of course, the real key to eliminating such barber shop conversations is to find ways to get people more involved in the life of their parishes. Because the inverse proportion rule is definitely the case. The more someone is involved in the life of their parish, the less entitled they feel to special privileges. Oftentimes, when I walk into a beautiful church, I pray for the people whose generosity in time and resources built it. They gave not from external pressure, but from interior love and generosity. The more our hearts are shaped by the Kingdom of God, the more we feel compelled to be generous in supporting and expanding the Kingdom. Fees in church do stink. I wish that every Catholic were so generous that fees would disappear, but most parishes struggle to pay their bills. That's because things are expensive. After all, a haircut at that barbershop costs $18 plus tip.